Thousands of middle-aged former disco-goers will wake with a heavy heart tomorrow morning after Cookstown’s premier ballroom of romance, Clubland, permanently closed its doors on Friday night. 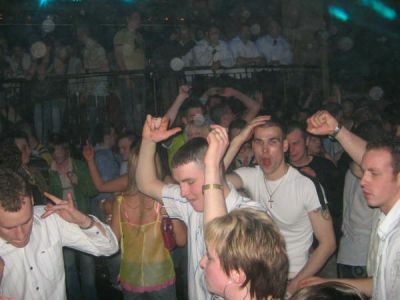 The Pink Pussycat, which drew millions of lurkers, drivers, drinkers and dancers every weekend since the 1980s, was reportedly once thought responsible for 71% of marriages and 92% of children born in East Tyrone during the 90s. Pope John Paul II was allegedly a fan of the venue as it kept numbers healthy in the predominately catholic areas around Ardboe and Derrylaughan. The former Clubland building will be replaced by a new sausage factory reportedly run by Owen Mulligan. Posted on April 10, 2015, in GAA and tagged ARDBOE, Christy Moore, clubland, Cookstown, molesworth street, Moortown, owen mulligan, pink pussycat, Pomeroy. Bookmark the permalink. 1 Comment.